Rental Rules In California Raise Questions About Who's Using Airbnb Santa Monica, Calif., approved a law that would outlaw most short-term rentals in the city. Some say many listings are by big companies. Others say such laws hurt homeowners trying to make ends meet. 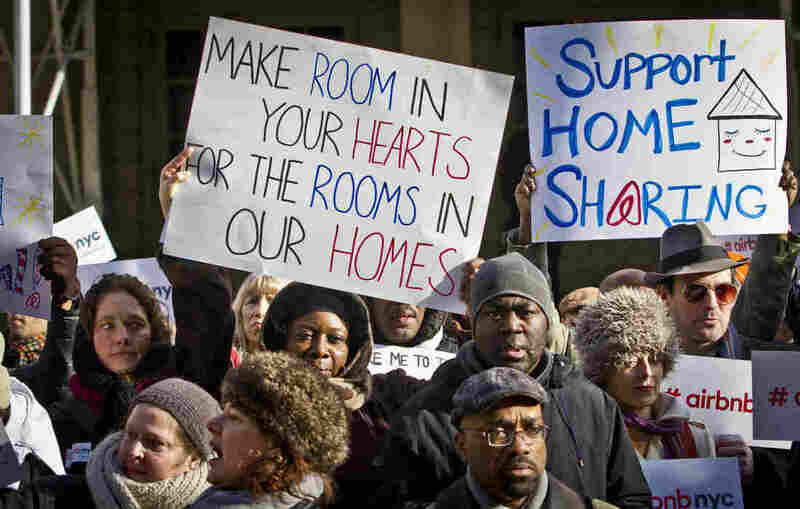 Supporters of Airbnb hold a rally outside City Hall, in New York. Cities throughout the country have been cracking down on the vacation rental site, prompting protests like these across the country. Eighty-year-old Arlene Rosenblatt rents out her quaint converted duplex in Santa Monica, Calif., whenever she and her husband leave town to visit their seven grandchildren. She charges anywhere from $115 to $220 a night for her home, listing it on Airbnb and other sites. But over the past few weeks, Rosenblatt's time has been filled with protests instead of family visits: she is one of dozens of Santa Monica residents fighting new city rules for short-term rentals. Cities from New York to San Francisco are trying to crack down on websites that allow people to rent out their homes, short-term, to strangers. The beachside city of Santa Monica, in Los Angeles County, is the latest. The new regulations, which go into effect June 15, say any rentals 30 days or shorter can take place only if the owner or permanent tenant stays in the house with the guest during the whole rental. The rules also implement a 14 percent tax on those rentals and mandate business permits. The requirement that Rosenblatt stay in the home during rentals would make most of her Airbnb postings illegal; under the law, she says, she and her husband could lose up to $20,000 a year. That would hurt. "I'm a retired schoolteacher," Rosenblatt says. "We don't get a lot of retirement income. My husband, all he has is his Social Security." And she argues that her rentals actually benefit Santa Monica. "We feel like we're adding money to the economy," she says. "When we have people staying in our house, those families spend more at Santa Monica businesses than we spend in months." Rosenblatt says the new rules are really intended for companies that use Airbnb, Homeaway, VRBO and similar sites to post multiple listings for places no one actually lives in. She's being punished for their actions, she says. "Of course I would get a business license," she said. "I would pay hotel tax. But it's not fair for us to have to follow the same regulations as big business does." So the big question is: Who's really using Airbnb — grandmas or big business? Roy Samaan, a policy analyst with the Los Angeles Alliance for a New Economy, says the answer is a bit of both, but that large companies are definitely involved. "The public persona that [Airbnb] portrays does not really connect with which users generate the revenue," Samaan says. Samaan led a study on Airbnb in LA recently, using publicly available data on Airbnb rentals from one day last October. He found that a third of Airbnb revenue in the city comes from leasing companies and big vacation rental agencies: businesses with lots of listings, often for apartments that are only used for vacation rentals. Samaan calls them "de facto hotels." Samaan's study even said some listing agencies use names like "Danielle and Lexi" in their Airbnb profiles, and add pictures of young women. One of those companies, Globe Homes and Condos, told NPR names and photos were used because Airbnb required them, not out of an effort to deceive users. Whatever name is attached to the listing, Samaan says those rentals drive up rental prices by cutting into the number of residential apartments available — not just in Santa Monica and LA, but in cities around the country. "Supply and demand exists," said Samaan. "When you have a tight rental market where we know that renters are being squeezed by prices, by availability, this really exacerbates those market forces." Even a study commissioned by Airbnb itself earlier this year found that Airbnb increases the price of a one-bedroom apartment in San Francisco by an average of $19 a month. But Airbnb's head of policy, David Owen, says Samaan's study uses incomplete data and is inaccurate. "It's absolutely false," he told NPR. His company says 82 percent of LA users only rent out the space they live in, so they aren't taking units out of the market. The company also says that 91 percent of hosts in LA list a single home (or room in that home). And, Owen says, when it comes to rising rents in places like New York, San Francisco or the LA metro area, you can't pin that crisis on Airbnb — a company that has been around for only six years. "Cities like Los Angeles and Santa Monica are facing affordable housing issues that are decades old," Owen said. Is Airbnb Cracking Down On Leasing Companies? But since Samaan's study was released, Airbnb has been quietly removing listings from some of the companies he highlighted, according to two such companies and the Los Angeles Short Term Rental Alliance, or LASTRA. Ronnie Mickle of Stay City rentals, one of the companies that had listings removed, says: "The loss of Airbnb did not affect our business as much as it did insult it. Our company has never been a fan of Airbnb as a corporate citizen." And Robert St. Genis, LASTRA's director of operations, says the company is continuing to remove listings without clarifying any policy around who gets to be on Airbnb and who doesn't. Airbnb wouldn't comment on whether a specific policy exists around Airbnb users' removal, but they did say in a statement: "We routinely review our platform to ensure our hosts are delivering the kinds of experiences our guests expect and deserve." But St. Genis suggests the removals are meant to maintain a certain image, one more focused on grandmothers than big business. "It's politically expedient," St. Genis says. "It's easier to run on the limited-income Social Security recipient trying to make ends meet." Airbnb's end-all, be-all goal is their IPO. They need to be legal in as many places as possible to go public. And political appearance would matter, St. Genis argues, because Airbnb may be looking forward to an initial public offering — in which case, he says, "they need to be legal in as many places as possible." Cara Brown, who rents out four units in Santa Monica — including longer leases, as well as one unit rented for short stays — says she wants to fight to keep her short-term rental income. Losing the ability to rent that unit through Airbnb, VRBO, HomeAway and Flipkey will cost her up to $3,000 a month, she says. "I think [Santa Monica's City Council] are punishing a lot of people that they didn't intend to punish," Brown says. "People like me who've never had complaints from neighbors, who are just mom and pop owners. I think they're throwing out the baby with the bathwater. It's our private property." So Brown says she's going to put her "activist hat" on for the next few months and push for a change in the law: "I'm gonna try to get a referendum going." Rosenblatt, the grandmother of seven, says she might be part of that movement, too. 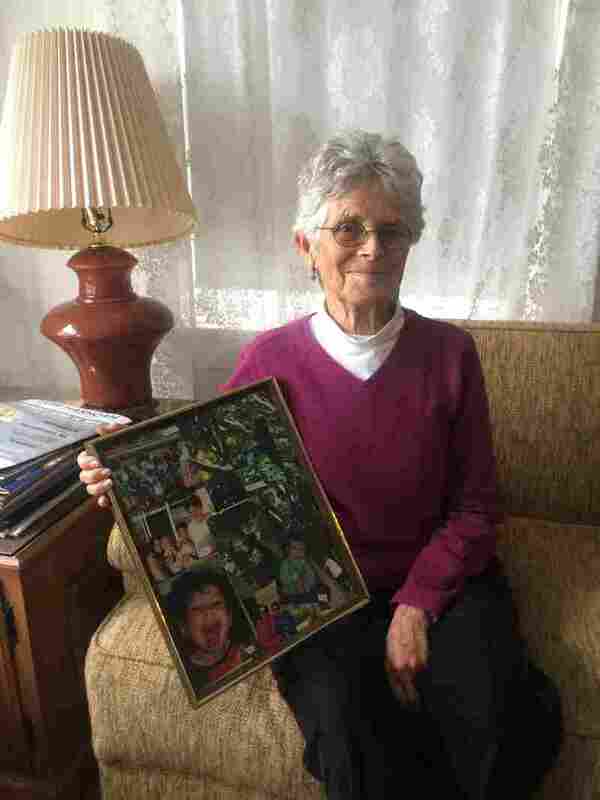 But, she says, with or without Airbnb, she's staying in her small duplex, with that wall full of her grandchildren's photos, just steps from the beach. "Obviously I could sell it and move somewhere else, but I'm living my dream right now," Rosenblatt says. "We walk almost every morning on the beach path. It's amazing. We love living in Santa Monica." Who else gets to stay in that home, and take that walk from Rosenblatt's house to the beach, is still a matter of debate.